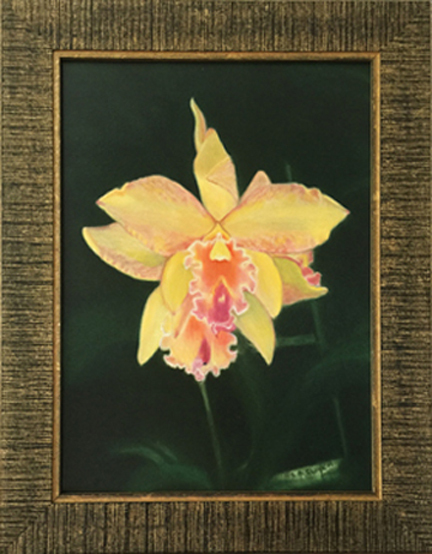 When I first saw this voluptuous Yellow Orchid in a pot under a low canopy of an avocado tree I know I had to paint “Bellissima”. I was mesmerized by its natural beauty and size that reached the height of 10 1/2″. The shade cast from the tree covered the plants and grass beneath it like a heavy blanket, muting all color to a dull tone. The one flower immune to this effect was this Cattleya Orchid radiating from under the tree like a morning sunrise. The Yellow was so bright I saw it from a block away and just kept walking towards it. I just had to take this beauty from nature and create the painting “Bellissima”. The yellows from the “Bellissima” orchid where so bright that they changed color throughout the day. As I painted “Bellissima” the same metamorphosis happened as the day changed the colors changed too. Creating this “Bellissima” Archival Digital Re-creation on shiny canvas and uniquely hand layered with oil to create this Flowers art, “Bellissima” framed with this modern black and gold linear design frame with surrounding gold tone for an exhibition at the Agora Gallery in New York City and exhibited at Neiman Marcus Fort Lauderdale during their Trend Event and Artist Showing. This is the second and only unique piece available.